The Samsung Z1 is now expected to be unveiled in India on January 18th. The Tizen flavored handset will feature a 4-inch screen with a resolution of 480 x 800. As you can guess right off the bat, this is not a high-end model. With a dual-core 1.2GHz processor driving Miss Daisy, this would actually be considered an entry-level phone that is designed for emerging markets. The handset will have 768MB of RAM and 4GB of native storage. In the almost certain case that you need more memory, a 32GB capacity microSD slot is provided. A 3MP camera graces the back of the phone, which also offers a .3MP front-facing snapper. 3G, Bluetooth 4.0 and Wi-Fi connectivity is included, and a 1500mAh battery keeps the gerbil wheel spinning. Tizen 2.3 is pre-installed. We should also point out that the device supports dual SIM cards and has an FM radio built-in. The Samsung Z1 was originally expected to be unveiled earlier this month. That event never took place, which leads us to the rumored unwrapping of the handset next month. Thanks for the tip, Arthur! Is Samsung trying to ruin the Z letter for Sony? Shock, do you see a market for it? Sorry, galaxies make me sleepy.. Honestly though, I think Samsung is going to lose some fights this coming year with the Chinese coming out strong. It's about time, it's obnoxious as each phone is identical to last with near identical specs, sleepy. I guess you're wide-awake since it's not a galaxy. Why would anyone buy this over LUMIA 535 AND MOTO G ?! price?! or umm..new OS obsession?! SamSung is tired of copying the form factor of the iphone that is why next year, they will copy the names.. Starting with Z1. Not everybody need a phone that is garnish with top end specs for a higher price. A regular user will need some browsing, email, whatsapp, facebook, pictures, sms and phone calls. And for this they follow the price. The worst phone design 2014 reward goes to.. This is a good start for Samsung it's an entry level phone with a new OZ what do you all expeCT. One day Samsung will be King of them all.. Does it come free in a cereal box? If this is sold higher than $40, its over priced. Same question here with whiteman (post no.12). I cant stop laughing on the specs, basically a rebranded bada os. No idea why Samsung Board of Directors approve that bad-looking phone. 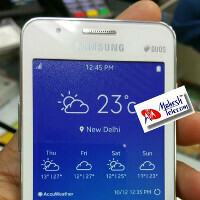 It looks far worse than Galaxy Trend Plus. Samsung is going crazy! On Top of it Samsung will price price it around $90+ in India I guess where it should have been around $70 max. What a Conehe@d, please tell me how the 6th iphone does not look like a Galaxy? Come on guys, give it a chance~ Well ya i do admit that the overall design is just a duh!, but well that the market segment that they are focusing now, low-end smartphone market. Beside, shouldn't we should feel happy that there is a new OS that will join the club? Especially it is from Linux Foundation. Let see how it goes when it release, can't wait to get one. sony left the S name whne samsung became very popular although they could have taken a ride on its popularity. now samsung is using a name that has been associated with the sony flagship. this company has neither pride nor shame. are they that desperate now that they're losing market share? they're still on top. their flagship android devices are excellent. why are they acting this s**ttily? That's one Fugly looking phone..
Oh my god, that tiny home button cracked me up xD xD I guess they didn't show the bottom part of the phone in the thumbnail for a reason xD. They could have at least give a minimum amount of effort in designing this phone as this is their "first" Tizen device which is available for consumers. Now just looking from design, it looks like even Samsung doesn't give much hopes into their Tizen project.